Crown Label, Inc. provides flexographic labels and tags for clients all over the US. We can produce up to 18″ x 24″, from blank labels up to seven color printing. Our promise is excellent customer service, superior quality with competitive pricing. Please contact us and we will be happy to provide a quote. Crown Label Inc. was founded in 1976 by Joseph D. Jenkins who was joined by Velma Jenkins in 1978. 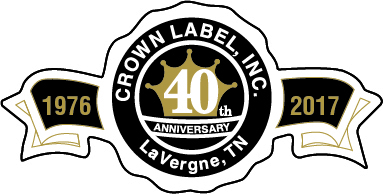 Crown Label started as a family business and continues to be one 40 years later. The plant is located in La Vergne TN and has 12 employees, it is a small enough company to have a close and friendly atmosphere but with eight presses it has the high volume and dedication to quality associated with bigger print shops. We have a complete in-house pre-press department as well as a state of the art platemaking system to insure quality 4 color process work.